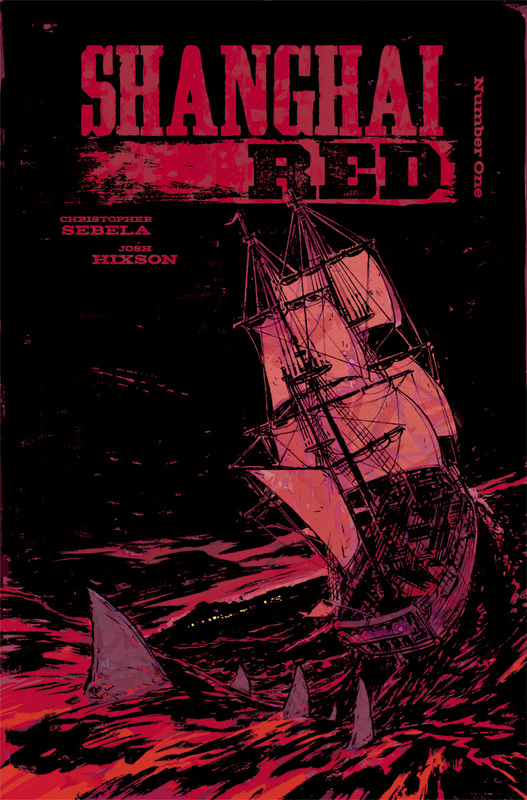 Shanghai Red is a brand new series from writer Christopher Sebela (High Crimes, Heartthrob, We(l)come Back) and artist Josh Hixson (The Black Woods), the first issue of which goes on sale next month. We were able to take an early look at the first issue, and were blown away by the mixture of historical intrigue and brutal revenge. Fortunately, both Christopher and Josh were able to take some time out of their busy schedules to sit down and have a chat with us about the series and the attention to detail that went into its creation. And if you’re wondering what Shanghai Red is about, well, why don’t we let Christopher tell you himself? CHRISTOPHER SEBELA: Back in the late 1800s, Shanghaiing was a crime that was pretty prevalent in most big port cities. Sailors on rest between trips or just unlucky people who walked into the wrong bar would get either ripped off, knocked out or drugged and end up working on a ship heading out to sea, their signature forged on the contract and no way to escape. Shanghai Red is about one of those unfortunates who got stolen way from Portland – the shanghaiing capital of the world at one point — and is now fighting her way back home to find the men who put her on that boat. In its bones, it’s a dark little revenge story about violence, America and identity. BCP: Tell us a little bit about Red herself. What’s her story? CHRISTOPHER: Red grew up a hardscrabble farmer’s daughter and she fought her whole life, to keep the farm, to get her family across the country, to get back home from this boat she’s been trapped on for the last two years. When she got to Portland, the only work available to women was work she didn’t feel suited for, while things like logging were considered “men’s work.” So she disguised herself as a man — Jack — to get the things she wanted. 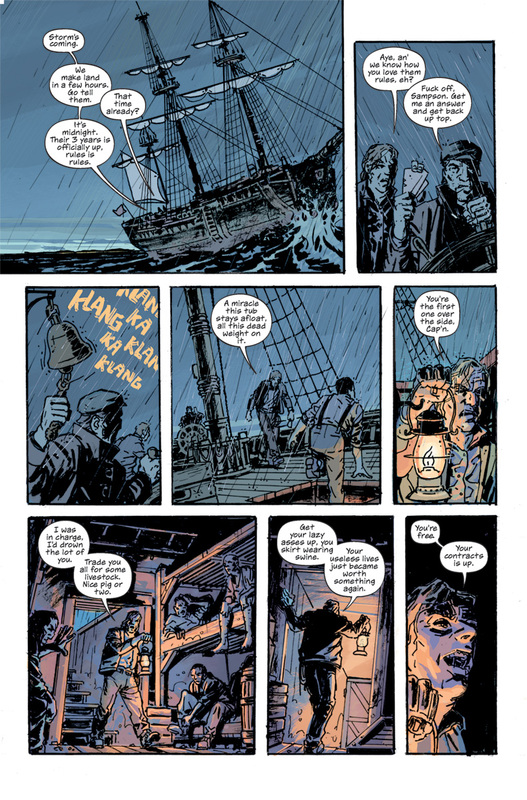 But being Jack got her shanghaied in the first place, even though hiding inside of him kept her alive. She’s really conflicted between these two sides of herself, while also trying to keep to her mission to punish the ones who were responsible for her abduction to kill them. She’s kind of a mess, in a good way. BCP: It feels like there’s a lot more going on here than a straight-up revenge tale. What can readers expect from the series as it unfolds? CHRISTOPHER: We like to think we’re doing a bit more than just a run and gun bloody revenge story. Like, none of the set dressing matters if you have characters that don’t exist to some degree. A lot of those moments between in Shanghai Red are about Red, her sister, her mother, the people who exist on the fringes of this country as it tries to figure out its way from out of the Old West and into the great industrialization of the 1900s and beyond. So… readers can expect that? All I can say for certain is they can expect gorgeous pages of art to stare at, while my words get in the way. BCP: How did the collaboration between the pair of you come about? CHRISTOPHER: We had a meetcute on Tumblr back in 2014. One of us followed the other and then I finally sucked it up and messaged him to say I liked his stuff and would he maybe want to work on a comic together? Amazingly, he said yes and I knew he’d be perfect for Shanghai Red. It just felt like kismet, running across Josh’s art when I had that story still burning a hole in my head. We got started in pretty soon after that. BCP: It sounds like you’ve been working away on this one for a while now, waiting for the right time to release it. Why now? CHRISTOPHER: It wasn’t that we were waiting, it was that we were making it. Neither of us was getting paid anything to make this book, so we’d have to take breaks to fit in paying work, so we could continue to live and eventually get back to working on it. It took us a few years to get those first three issues done because of that, but as soon as we could get it into Image’s hands and get a date set, we raced to do it. BCP: There’s a real feeling of authenticity to the recreation of the Portland press gang/Shanghai scene during this particular time period. Was that something you had an interest in beforehand, or was it something you had to do research into during the creation of the series? CHRISTOPHER: I had to do a lot of research. I never knew much about shanghaiing except as a term that people use for anything but the actual practice. Plus I’d just moved to Portland a few years before, so the history of my new home was something of interest. It just happened that all this stuff intersected when I went on a tour of the Shanghai Tunnels (a section of tunnels underneath Portland’s Old Town that were used to move goods and, some say, shanghaied people, to the shore of the Willamette without anyone seeing). I had the idea for Shanghai Red by the time the tour ended and then I just went into crazy research mode until I felt like I understood the world enough to write it to some degree of accuracy. BCP: Josh, have you had to make any tweaks to your existing artistic style or do any additional research of your own to help give the series its distinctive aesthetic? JOSH HIXSON: I didn’t really change my existing style to fit the book. I just happened to be inking and drawing in a particular way at the time that felt right for the story. I started with a pretty distinct rough style, but throughout the course of us making the book I found myself changing how I tried to draw. This led to me actually redrawing parts of issue 1; overall it worked out for the better. As for research, yeah, I had to do a bit of digging myself; more so for photo reference to figure out how things looked at the time. 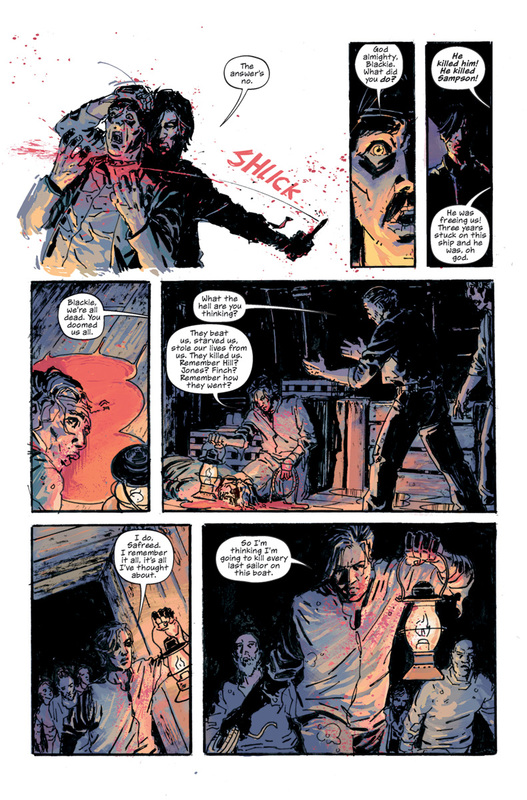 BCP: Colour plays a huge rule in the visual side of the book, particularly in the first issue. Is that something that was particularly important to the pair of you when you were putting together the look of the series? JOSH: Yeah we talked quite a bit about color when we first started. We actually meant to get a colorist to help speed up the process but it didn’t work out with the people we wanted so I ended up just going for it myself. 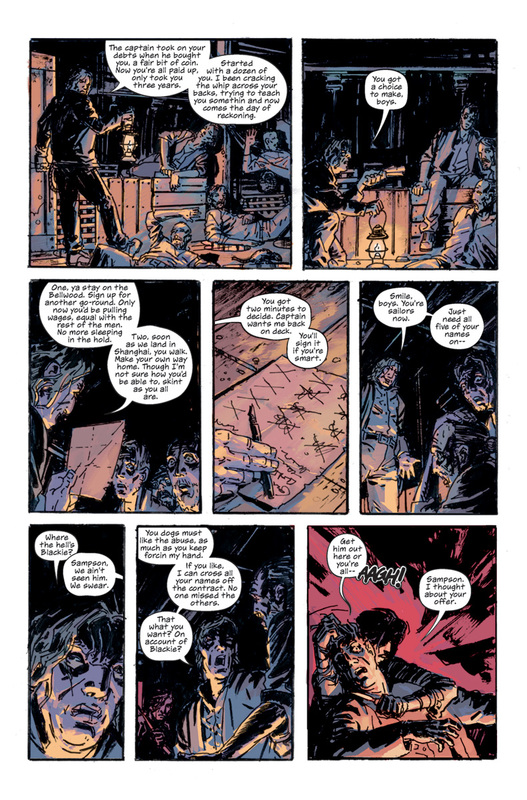 Much of the ideas for color were formulated through the pages we did for the pitch. The palette changed a bit as I got more of the story, though. It was more muted at first and the flashback sequences were black and white, which didn’t feel right once I read certain scenes. So it was a bit of a process to find the right balance but we’re both happy with what we landed on. BCP: And finally, what would you each say to someone who was on the fence about picking up Shanghai Red to help convince them to give it a try? CHRISTOPHER: Honestly? I don’t think there’s another book out there like it right now. We’re trying to merge history, revenge and drama into something that scratches all your itches. My main hard sell is one I’ve been making for years: no matter what you think of my writing, Josh has drawn and colored a beautiful book. I stare at the pages constantly and I wrote the damn thing. JOSH: Well, even if you do check it out for the art, you’ll definitely stay for the story. Chris has created something special with this book and I’m just glad to be part of it. And I’d have to agree, I don’t think there’s anything else out there right now that’s like it. SHANGHAI RED #1 goes on sale June 20th 2018 from Image Comics.